HealthCorps School Placement/State/City: West Palm Beach, Fla.
Fun Fact: I recently completed my second Half Marathon in honor of Women’s Wellness. I have a huge passion for health and overall wellness. When it was time to find a job closer to home after I finished my undergraduate degree, I searched for jobs in the educational health field. I was so grateful to find this job opportunity and within a few months of the hiring process I was able to share the news with friends and family. If I could’ve written up the perfect job for me it would include every aspect of this position; I love educating young minds, sharing my passion for health with adults, and changing people’s opinion on what it means to take care of yourself. I have loved every second I get to be at Palm Beach Lakes High School. The staff and students have welcomed me in and made me feel like I am home every day. Even though I live over an hour away from my placement, it’s worth the drive every morning because I’m excited to see my students and all the staff walking through the halls. Every program component I do at the school changes someone’s life and I see it before my eyes. 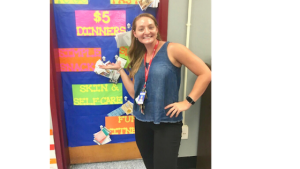 The staff wellness challenge, every Café Oh Yea, and every lesson I teach in the classroom, I can see how someone learns something and it will stick with them forever. I am involved with mental health professional development, monthly Café Oh Yea’s in the courtyard, monthly staff appreciation, I lead the student Health Club after school and I recently co-hosted the school’s very first health fair along with the help of Student Government. 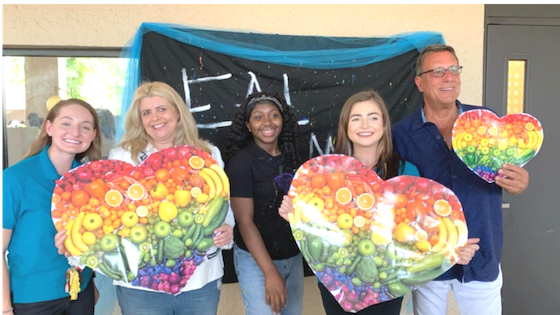 I have orchestrated community partners such as Palm Health Foundation and Palm Beach Substance Awareness Coalition to come into classrooms and courtyard events to showcase their initiatives in the community. After I complete my time with HealthCorps I will continue to finish my masters degree in Social Work and work as a personal trainer at a gym. My goal once I am finished with my degree is to work in a hospital setting as a social worker and continue my passion for health and helping others when they need it most. I’ve learned that everyone has a story and that everyone is doing their best each and every day. I have many students who struggle emotionally, physically and spiritually because of family challenges, gun violence in their neighborhoods, and a lack of support. Each student and staff member that I have had the pleasure of getting to know has told me a little part of their story and I am amazed that they have grown from their struggles and have become even more resilient through it all. This lesson that I learned from my time at Palm Beach Lakes has made me a better person and more willing to help others even when they don’t know how to ask for help. Brene Brown talks about how people are doing their best in her book Rising Strong, and I believe that all of the students are doing their best each day with what they are given. I’ve learned resiliency through the people I’ve met at my placement and I am forever grateful.